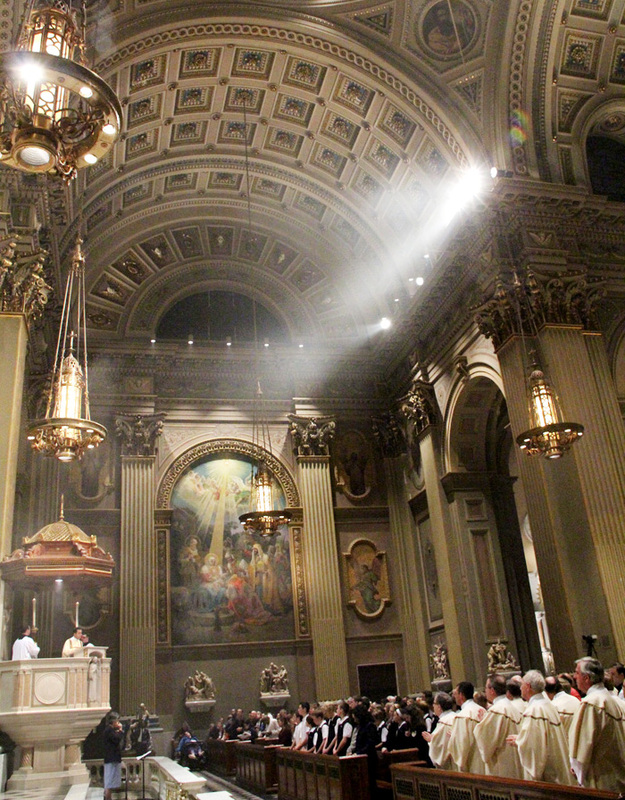 Archbishop Charles Chaput officially opened the Year of Faith called for by Pope Benedict XVI at the 6:30 p.m. Mass Oct. 14 at the Cathedral Basilica of SS. Peter and Paul. Judging by the turnout it should be a very good year. There were 1,127 members of the laity, bishops, priests and religious filling the Cathedral for the liturgy. We know the precise figure because this happens to be October when the cathedral staff, along with every other parish, counts the house. In this particular rendition of Jesus confronting the skeptical Thomas after his Resurrection, the Lord takes the apostle’s hand and guides it into the gaping wound in His side. “Just as Jesus guided the hand of Thomas into the wound in His side, Jesus wants to guide us into His heart,” the Archbishop said, explaining our faith is really a gift from God. “When Pope Benedict XVI declared this as a year of faith, he told us that we must study our faith so that we might understand it,” he said. Although many of us think we know all about the Catholic faith, none of us really do, and all must continue to study, the Archbishop explained. He used the example of King Solomon, who in the Old Testament asked God for the gift of wisdom, which was granted to him, yet in his later years he abandoned this wisdom and worshipped false idols. 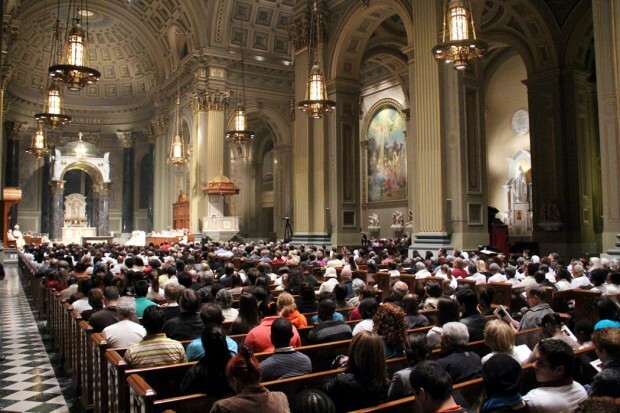 “All of you who think you know all about our faith should think again,” the Archbishop said. To really think about the faith when it came time for the recitation of the creed during the Mass, the Archbishop asked everyone not just to recite it from memory, but actually read it aloud from the missals or other materials in the pews. The Year of Faith, which officially began Oct. 11, marks the 50th anniversary of the opening of Vatican Council II by Pope John XXIII. Clearly the Archbishop’s words resonated with his congregation, which burst out into spontaneous applause at the conclusion of the homily. “The Mass was beautiful and the homily was wonderful,” said Christine Crowley, who came with a very large group from our Lady of Good Counsel Parish in Southampton, including at least three full pews of students from the parish school. Jared Smyth was there with a group of college students who as part of the Fellowship of Catholic University Students live in community at the former convent of Nativity B.V.M. Parish in the Port Richmond section of the city.